Ann: You want to take this, or should I? Integra: Oh, let me start. You’re bragging about bullets? You forget, Dandy: you’re attacking the most advanced armory in the world. Dandy: I don’t think you get just how awesome these bullets are. Ann: But wait! There’s more! 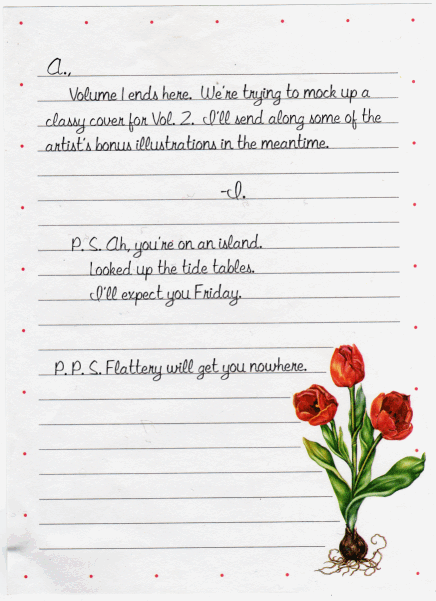 Volume I ends here. We’re trying to mock up a classy cover for Vol. 2. I’ll send along some of the artist’s bonus illustrations in the meantime. P.S. Oh, you’re on an island. Looked up the tide tables. I’ll expect you Friday. P.P.S. Flattery will get you nowhere.